Your company is invited to be a Sponsor of one of the many programs offered by the International Council of Fine Arts Deans. In doing so, your company's name will be prominently placed before hundreds of Deans and Associate Deans throughout the world who receive e-communication from ICFAD and who attend our Annual Conference in October. Each part of our Conference – from the Receptions to the Educational Program to the Lunch Programs – offers name-recognition opportunity. We hope you will agree that we have developed a sponsorship opportunity to serve every level of financial support. If your company would like to have an exhibit at the ICFAD Conference, as well as receive added name recognition benefit by sponsoring one of the Conference events, please consider the possibilities described here. The day before our Conference begins, ICFAD offers its Deans the opportunity to arrive early for a full-day of smaller-group education with peers. Topics include Development (for Deans and members of their Development team); Mentoring Initiatives for New Deans (a very popular program intended to support Deans who have been in their positions for three years or fewer); and Fellows (an enrichment program for future Deans). Meet and greet all who have arrived the day before the educational seminar, as the host of our Wednesday evening Opening Reception. The Thursday morning Breakfast before our program starts is where many people will pick up their Conference materials, and see their colleagues and friends for the first time. Your company can be part of the upbeat beginning of the main Conference day. Capture your audience while they are stepping out of the classroom area. The Deans are yours for meaningful conversation, while enjoying a break that your company has provided. They will certainly be appreciative. The luncheon on Thursday is part of the educational program and features a speaker of national prominence. There are so many creative ways we can capture your audience's attention mid-day! An ice cream cart or a host of other fun ideas will energize the Deans as they continue with their education and networking. Your company can make the magic happen! This event is always well attended, and all appreciate the cocktails and hors d'oeuvres after a full day of seminars. Following two full days of education and idea- and resource-sharing with colleagues, Arts Deans are energized! Sponsoring the Closing Reception at ICFAD's Annual Conference is a great opportunity to deliver your company's marketing message with an enthusiastic and receptive audience. Join us as we board a private bus to tour and experience the arts in the city we are visiting. The half-day, Saturday excursion is a much anticipated opportunity for our Deans and Associate Deans to network together and explore what is happening in the arts in other parts of the country, in a relaxed setting. Your institution or company may clearly communicate your message to our Deans by placing your advertisement in our Program Book, produced annually and distributed at our Conference. This publication is a high-quality, four-color book that serves as a commemorative piece for each ICFAD Annual Conference. Full-page ads (7.75" wide x 10.25" high, no bleed) are available for $1,000 and half-page ads (7.75 " wide x 5" high) are $750. After each Conference, the program book is available to members throughout the year, on the ICFAD website. 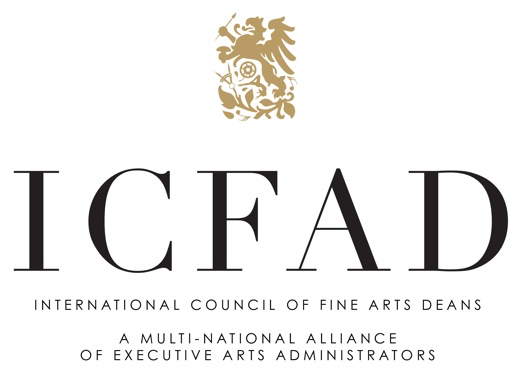 In addition to companies selling products and services to ICFAD member institutions, our members themselves have used this opportunity to communicate with other institutions about new degree programs being offered, productions available, and more. Your company may prepare flash drives with Conference materials provided by the faculty and supplementing printed books. Your company may either provide the flash drives with your logo on them, or underwrite the expense of purchasing flash drives with the ICFAD logo on them. Demonstrate the technical abilities of your company (as are needed in lectures and demonstrations) by providing equipment and a staff person to operate the equipment, during our educational seminar, attended by Deans and Associate Deans from around the globe. For a printable document featuring Sponsorship Opportunities, please click here. Please call the ICFAD office for sponsorship opportunities, (561) 514-0810.